The long-in-the-making first-person shooter Aliens: Colonial Marines is still alive and coming out in the spring of 2012, according to a chest-beatingbursting announcement from the movie studio behind Aliens, the publisher of Sonic the Hedgehog and the creators of the award-winning game Borderlands. The unlikely trio of 20th Century Fox, Sega and development studio Gearbox Software will be making what they're calling a "true sequel to James Camerson's classic Aliens." Either that's a shot at David Fincher's controversial Alien 3 or it's simply a verification of what the game's new teaser trailer shows the game to be: a direct storyline-sequel to Cameron's Aliens movie. In the game's new trailer, which you can see here, unseen men, presumably colonial marines, are discussing the U.S.S. Sulaco, the military ship that transported Sigourney Weaver's Aliens heroine, Ellen Ripley, and a group of Marines to LV-426, the planet on which most of Cameron's movie takes place. On that planet, Ripley and a rapidly-dwindling team of human fighters fought the Aliens before struggling back to the Sulaco. In the trailer, the male voices refer to Ripley as having checked herself back into cry-sleep. They also refer to Paul Reiser's Carter Burke deceased character and the ripped-in-two artificial person Bishop. The men decide to go to the Sulaco, but there's no indication if Ripley, Bishop, or any of the other few survivors of Cameron's movie make it into the game. 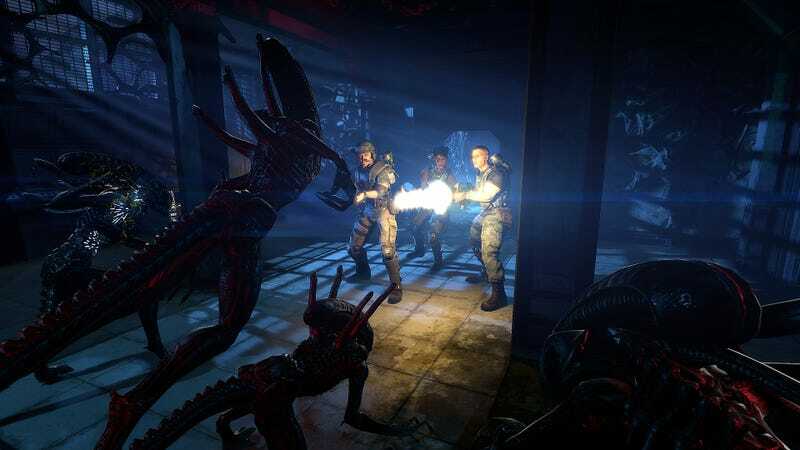 The Aliens Colonial Marines game is set to be a first-person shooter that supports up to four players proceeding through its storyline together. The new press release for the game says players will be able to drop "in and out as necessary through self-contained missions within an over-arching narrative." Players will be able to upgrade and customize their characters, gaining new weapons and perks. The game's levels will be set across "authentic environments inspired by the film series including Hadley's Hope, the Sulaco and LV-426." Aliens: Colonial Marines begins with an ostensibly abandoned ship, the U.S.S. Sulaco, recovered in orbit around LV-426. Players lead a group of highly trained United States Colonial Marines as they board the deserted craft to uncover the fate of the crew. They will have to fight to survive unspeakable horrors and their own anxieties as they chase down the truth behind a galaxy-spanning deception that places humanity at the mercy of the most murderous and deadly species in the universe. We'll be seeing the game at E3 and meeting with Gearbox Software chief Randy Pitchford, whose team is also getting Duke Nukem Forever out this month. Look for Colonial Marines on Xbox 360, PlayStation 3 and PC in the spring of 2012.